Goodreads says, "In search of a future that may not exist and faced with the decision of who to share it with, Cassia journeys to the Outer Provinces in pursuit of Ky - taken by the Society to his certain death - only to find that he has escaped, leaving a series of clues in his wake. Cassia's quest leads her to question much of what she holds dear, even as she finds glimmers of a different life across the border. But as Cassia nears resolve and certainty about her future with Ky, an invitation for rebellion, an unexpected betrayal, and a surprise visit from Xander - who may hold the key to the uprising and, still, to Cassia's heart - change the game once again. Nothing is as expected on the edge of Society, where crosses and double crosses make the path more twisted than ever." Cassia is on a mission to find Ky who was sent by The Society to the Outer Provinces, but, thankfully, escaped. While trying to search for him, she comes across clues and gets to see what life is like closer to the border. During Cassia's journey, she learns the truth about many things including more information about the Uprising. Crossed by Ally Condie is an entertaining follow-up to Matched and the second half of the novel will leave readers in a state of suspense. Cassia shares the point of view with Ky and it alternates each chapter. This took me awhile to get used to, because I'd prefer the narration to be one hundred percent Cassia's; however, I understand why Condie had to do this. Cassia is still such a fascinating heroine and I loved to follow her on her journey. Readers will learn more about the world that Cassia lives in and the Outer Provinces which hold many secrets. I must admit that I found Cassia's journey to be a tad tedious and repetitive until the second half of Crossed which is when things really heated up. Ky, although not my favorite character, was entertaining nonetheless, because readers will learn more about his background in Crossed. It was interesting to read the chapters from his point of view and in turn, readers can better understand where he is coming from. All the while, Xander is still someone referred to a lot and thought a lot about by both characters. I wish there were more of him in Crossed! Cassia is still harboring feelings for him and there's another secret that he's withholding as well. Fans of Xander will only get to see him briefly as this is more Cassia and Ky's book. I really enjoy Condie's writing style. The incorporation of poetry and her lyrical descriptions are lovely. I found myself re-reading certain lines that flowed so beautifully. Her graceful writing style was juxtaposed by the rustic setting and raw emotions in Crossed. She's so talented! Even though I am not in love with Crossed like I was Matched, I recognize that it serves its function as a setup for what I think is going to be an incredible finale. The ending of Crossed left me dying to find out what happens next and Condie left us with a heck of a cliffhanger. I can't believe we have to wait a whole year! *Thank you to Dutton for sending me this ARC in exchange for an honest review. I haven't read Matched yet. I rushed out and bought it when it was first released, and it's been waiting for me ever since. I wish I had more time to read each day. I think you really got it right with this review of Crossed. It isn't quite up to the level of Matched but it is still good. I did like reading the chapters with Ky (at times I preferred them to Cassia's chapters). I agree that it was really interesting to find out more about life outside the Society and that there is a rebellion going on. I also kept wondering if the place they were hiding in was the Grand Canyon. I wish I'd spent more time enjoying the poetry and symbolism too. I think I read too quickly because I was reading for an ARC tour. Excellent review! "I must admit that I found Cassia's journey to be a tad tedious and repetitive until the second half of Crossed which is when things really heated up." Couldn't agree more Christina! I had trouble getting into this one for that very reason, but once they finally found one another again I remembered why I loved Matched so much:) Definitely looking forward to the next book! So good but not as good. Noted. I still can't wait to read it. Thanks for the awesome review. Talk about great timing for me: I just finished reading Matched over the weekend on vacation and was stunned to discover that it was the first book of a planned trilogy. I hadn't read any reviews of it but I was aware of the hype/buzz and so I finally got around to reading it. 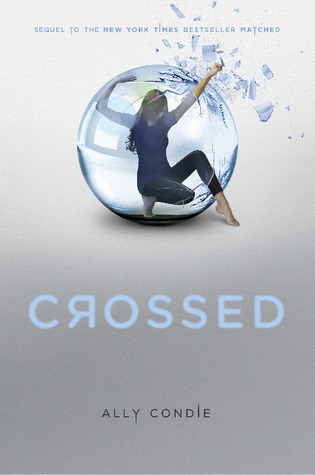 now I'm going straight to my sales rep to request a comp copy of Crossed now. But I'm bummed that you say it's such a cliffhanger! Mrs Q- I agree! I wish I had more time to read. I hope you get to read Matched soon. Christina - I agree....I was thinking the Grand Canyon too. Jenny- I'm glad we agree! Thanks for stopping by! Juju- No problem. Thanks for visiting. Crowe Flies and Reads- I hope you get to read Crossed soon! Thanks for visiting. I didn't love Matched - I thought it was OK, but very slow at times. Still, I will check this one out, although I've heard that it too is very slow moving at times. Very interesting review. I have Match right now, but reviews of Cross make me wonder if I should wait until the next book so I can read them all at once. Hm...I like Matched but didn't love it...so I wonder how I'll feel about this one!? We'll have to wait and see, I guess! Thanks for the great review!